Get ready music lovers! If you are in Washington D.C. on Saturday, October 8th--you are in for one rockin' treat. There are expected to be over 12,000 fans gathered to jam out with bands like Passion Pit, SOFI TUKKER and Empire of the Sun. The Fall Classic is one of the most anticipated events in the southeast D.C. area. 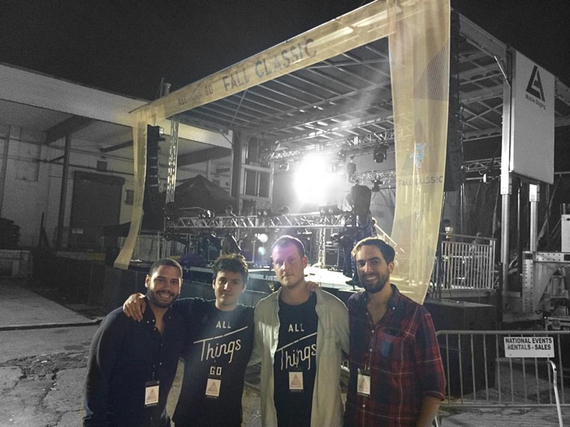 For over ten years, Will Suter, Adrian Maseda, Stephen Vallimarescu and Zack Friendly have been making a name for themselves on the internet with their music blog All Things Go. They are now focused on bringing their internet sensation to the real world with the electro-pop musical festival. How did these four guys create a must-attend festival in the nation's capital in just two years exactly? "We all grew up here in D.C. and have known each other for a very long time," Zack Friendly told me. He continued, "We started a music blog together in 2006 just to share our favorite music with our friends. It turned into a much larger thing than we expected, which is very exciting. In 2011 we decided to add a live element to our brand which includes after parties and concerts. We saw the live element as a natural progression to turn this into something to share not only with an online fanbase but to larger communities in D.C. and larger areas." The four guys had different tastes in music that meshed perfectly together to create a diverse and unique blog. Stephen Vallimarescu followed up by saying, "Bands like Empire of the Sun create an incredible live experience. They inspired us to get into the live business and start to bring in artists that we feel emulate those live shows." Will Suter agreed. He said, "Passion Pit was an influence for us when we were growing up. When we started the blog we had a feature on them every Sunday." Ten years after blogging about Passion Pit, the gentlemen are bringing in the band to co-headline their own festival that they created from the ground up. The festival has created incredible partnerships with different food vendors including Shake Shack, Beefsteak and Milk Cult. Fans can indulge their stomaches while listening to amazing musical acts including Bishop Briggs and Sylvan Esso. Zack Friendly told me that All Things Go has changed for the better since launching in 2006. "When you start a music blog you are sort of an outsider. You are just a fan. You don't have the industry connections that we do now. One of the big things that has changed is that we have built meaningful connections with these artists, managers and labels that have allowed us to debut music. It has allowed us to be on the cutting edge of new music. That makes our job a lot easier," he told me. Will Suter agreed. "For sure. From an organizational standpoint starting as two guys to now having a whole staff of writers for the site is pretty crazy. It has allowed us to grow. It's been cool to be a journalistic and editorial destination. We work really closely with Spotify. It's been an incredible growth." Stephen Vallimarescu echoed the sentiment of his friends. "We focus on music discovery. That's what we started with the website and that is what we are doing now with the festival. We are excited about having artists like Bishop Briggs on our lineup." The guys are beyond hyped about the growth of the festival and expect it to get bigger as the years go on. With their direct relationships with the artists, the four millennials are taking over the festival scene with lightning speed. When they hear about how the generation before them often knocks on young people's work ethic, the All Things Go team has a response. Will Suter said with confidence, "It has been very exciting for all of us. We are around people our age who are doing incredibly interesting things--laying it out all on the line. Putting together festivals like these are not super cheap things. They are not things you put together in 48 hours. It requires commitment and dedication. We are serious about what we do and are very driven." To purchase tickets to The Fall Classic, you can visit the website by clicking here.